The Jedi Exile was created by Obsidian Entertainment as the primary protagonist in the 2005 PC and Xbox video game Star Wars: Knights of the Old Republic II: The Sith Lords ( Amazon link). 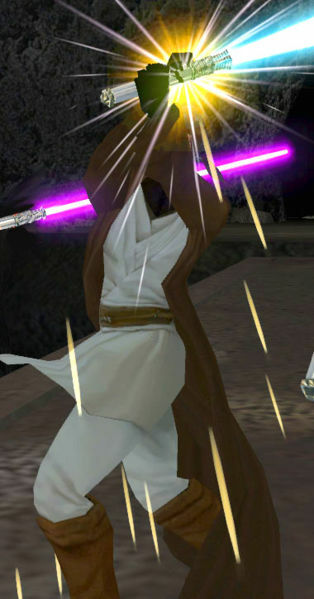 As of this time, the character called the Jedi Exile has no name, because the player is prompted to create one, or select a randomly generated identity at the start of the game. Because of this, in game characters only refer to her as “the exile.”Although the character’s canon allegiance has not been stated precisely, she is called a “heroine” in The New Essential Guide to Droids. This is backed up by the fact that, as of the release of The Sith Lords, every canon game ending has been the light side version. The Knights of the Old Republic Campaign Guide has confirmed that the light-side ending is indeed the canonical one. The Exile’s Jedi class is as of yet unknown. However, after she helped Queen Talia and the Onderon Royalists defeat General Vaklu and his traitorous forces, Kavar told the Exile that he tried to convince her to become a Jedi Guardian like he was, saying that they could have used someone like her. The Exile can learn both the Ataru and Shien lightsaber forms regardless of whether or not she was a Jedi Guardian or Jedi Sentinel, or their corresponding classes, the Jedi Weapon Master and Jedi Watchman, respectively. However, if she was a Jedi Sentinel or Watchman, she would learn the Niman discipline from one of the Masters. If she was a Jedi Guardian or Weapon Master, she would learn the Juyo discipline instead. According to the official strategy guide for The Sith Lords, should the Exile have trained Bao-Dur in the ways of a Jedi Guardian, she would have been able to train him in the use of advanced lightsaber forms and techniques This is cut content, and never made it in the final pressing of the game. As a child, the Human female who would be known as the Jedi Exile was found and separated from her parents by the Jedi Order. Like many Jedi of her day, she started her training as a Padawan at the Jedi Enclave on Dantooine. She was taken as an informal Padawan by the Jedi Knight Kavar. After Kavar left to fight the Mandalorians in the early skirmishes, she trained under many Masters, including the Jedi Master Vima Sunrider, daughter of the famed Jedi Nomi Sunrider. 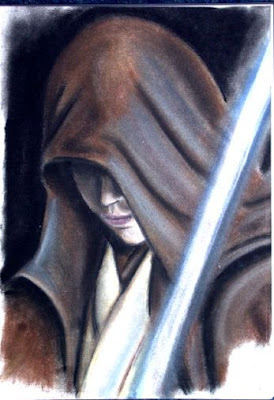 Master Sunrider would often caution the young Jedi to be mindful of her powers, especially her aptitude for severing one’s connection to the Force. When the Mandalorian Neo Crusaders launched an invasion of the Galactic Republic, the Exile had overwhelming compassion for the lives lost in the Outer Rim. Inspired by her former Master Kavar, who had fought in the early skirmishes, she soon joined the ongoing battle, and became part of the Jedi Knight Revan’s faction of Jedi after being personally recruited by Malak himself. She left a prospective Padawan, Mical, without a Master. The Exile served as Revan’s most trusted general, second only to Malak, during the Mandalorian Wars. She would prove her skills in battle and her knowledge of warfare in many of the war’s bloodiest battles and campaigns, including the second battle of Onderon’s jungle moon Dxun. She also attained the rank of Jedi Knight during the war, but no knowledge is known as to how this happened. Overseeing the final battle at the Sith planet Malachor V, she gave the order to activate the Mass Shadow Generator when it was clear that the bulk of the Republic’s forces, led by Revan, would not arrive in time to engage the Mandalorian armada. She watched silently from the bridge of her command ship as the generator crushed both the Republic and Mandalorian forces caught in its destructive wake. The ensuing death and destruction, particularly that of the comrades she had led and befriended during the war caused such a substantial wound in the Force that the shock would have killed the Exile had she not unconsciously, and instinctively, severed her own connection. Thereafter she was deafened to the Force’s call; incapable of sensing it through the interference caused by the Force echoes of the suffering that she had inflicted and been forced to witness. The only Jedi under Revan able to turn away from the dark side after Malachor V, she was also the only Jedi to willingly return to the Jedi Temple on the Galactic Capital Coruscant and face trial for her actions—and also to defend them. Malak originally wanted Revan to use his assassin droid HK-47 to eliminate the Exile, but Revan, who referred to her as a Jedi “who was already dead,” wanted her to face the Council and show them the hypocrisy of their teachings, and so let her leave. Despite an impassioned plea, the Jedi High Council decreed that because she had followed Revan to war, she was to be cast out of the Jedi Order. The Council feared the “wound” in the Force that surrounded her. Some on the Council, most notably Jedi Master Zez-Kai Ell, felt that they were punishing the Exile not because of what she did, but because she was symbolic of the many Jedi that had fallen to the dark side over the course of history. These Council members felt that she was the perfect opportunity to examine why and how so many Jedi fall to the dark side. But more conservative Council members, such as Master Atris, felt no need to do more than exile the former Jedi, even going so far as to comment that it was as though she were already dead. Full details of the Exile’s adventures in the Outer Rim are unknown, but it is known that Atris had orchestrated the Exile’s return to known space. In order to trick the Sith into revealing themselves, Atris leaked her return to the galaxy and, predictably, attracted the attention of the Sith Triumvirate. The Exile’s return to Republic space occurred in 3,951 BBY, in a time where Revan had vanquished Darth Malak and the last of the Jedi were being hunted down and exterminated. The Harbinger, a Republic cruiser bound for Onderon, had been ordered by the Republic admiral Carth Onasi—a veteran of the Mandalorian Wars and the Jedi Civil War—to abort the planned trip and head to the Outer Rim in order to pick up the Exile. She was requested to be given status as a diplomatic passenger and escorted to Telos IV, though it was made clear that she was to be given no special treatment nor to make any indications of her identity. During the trip to Telos, the ship received a distress call from a low-stock freighter, claiming to be engaged in a firefight with a Sith warship. When the Harbinger arrived, they found the ship derelict; after the crew boarded the vessel they found it to be empty, save for the battered body of Sith Lord Darth Sion. The Ebon Hawk, a small freighter that once had played a major role in the Jedi Civil War, also seemingly deserted, was picked up as well. In the next few days, crew aboard the ship began to disappear; when Darth Sion finally awoke, saying that he had come for the Jedi, the stealthed Sith Assassins revealed themselves and slaughtered the ship’s crew en masse. In the ensuing chaos, it went unnoticed that an HK-50 unit had drugged the Exile and sealed her away. As the ship died around them, the Sith Lord Darth Traya—going under the guise of her former identity of Jedi Master Kreia— found the Exile and brought her back to the Ebon Hawk and attempted to flee. Unfortunately they attracted the attention of the now fully-operational warship, which fired on the freighter, damaging it severely and nearly killing both the Exile and Kreia. With the help of the utility droid T3-M4, the Exile was taken care of and the Ebon Hawk was guided to the nearby Peragus Mining Facility. When the Exile awoke from her torpor in the mining facility’s medlab, she found Kreia’s inert form. After Kreia awoke and told the Exile that they had to find a way off the station, she found the facility to be completely abandoned except for malfunctioning mining droids, which attacked the Exile on sight. To add to the mystery, the Exile’s Force connection slowly began to return; while searching for a way off the station she found a male scoundrel named Atton Rand, who was imprisoned within a force cage in the station’s brig. After Darth Sion and a group of Sith Assassins arrived on the Harbinger intending to kill the Exile, believing she was the last of the Jedi, the three escaped with T3-M4 aboard the Ebon Hawk, traveling to Telos since it was the only available destination in the Peragus facility’s navigational charts. While being pursued by the Sith in the asteroid field around Peragus, laser fire from the hijacked warship ignited the volatile fuel within the asteroids. The resulting explosion destroyed both the facility and the planet itself, though the Ebon Hawk and the Sith on board the Harbinger were able to escape. When the Exile and her crew arrived at the massive Citadel Station in orbit around Telos IV, the Ebon Hawk and T3-M4 were stolen and brought to the Telosian surface while they were held for questioning about the Peragus explosion. After a Telosian investigation proved their innocence, they were asked by Lieutenant Dol Grenn to stay on-station until the Republic’s inquiry was complete. Instead, the Exile allied herself with the Ithorian Force adept Chodo Habat, eventually gathering enough evidence to expose Jana Lorso, the executive of the Czerka outpost on the Citadel Station. After gathering the necessary evidence to bring Lorso down, and after the Exile saved Habat from mercenaries hired by Czerka to kill him and his herd, he allowed the Exile and her companions to use one of their shuttles to reach Telos’ surface, where they were shot down by a Czerka air-defense turret. An Iridonian Zabrak engineer named Bao-Dur, who had designed the Mass Shadow Generator and served under the Exile at Malachor V, saw the crash and pulled the three unharmed from the wreckage. While on the surface, they learned that the Ebon Hawk had been taken to the old planetary aqueducts in the polar region of the planet. Commandeering a shuttle from an abandoned military compound, the Exile and her companions traveled to the aqueducts and found Jedi Master Atris there, a former member of the Council that sentenced the Exile. Atris was attempting to recover lost Jedi teachings and had surrounded herself with several Echani sisters. These sisters, known as Handmaidens, had vowed not to learn the ways of the Jedi. After a heated debate over what the Jedi should have done during the Mandalorian Wars, the Exile and her party left with the Ebon Hawk and T3-M4. When they left, T3-M4 revealed that he had managed to download Atris’s database while being held, including a recording of the Exile’s trial and records of where the last five remaining Jedi Masters were hiding: Atris on Telos, Kavar on Onderon, Vrook Lamar on Dantooine, Zez-Kai Ell on Nar Shaddaa, and Lonna Vash on the Sith tombworld Korriban. Coincidentally, although Kreia believed otherwise, these were the same five Jedi on the Council that cast the Exile out of the Order. However, Brianna was ordered by Atris to sneak aboard the Ebon Hawk and aid the Exile in her mission in order to monitor the Exile’s activities in order to confirm that the Exile still served the light side. The crew, together with its newest member, went off to these worlds in search of the Jedi in an attempt to unite them against the Sith and to find the answers as to why the Exile was sentenced as such. During her adventures, the Exile met many beings who became her companions. She found many of them to be Force-sensitive, and thus she trained them in the Jedi ways. During this time the Dark Lord of the Sith Darth Nihilus had sent his Shadow Hand, the Miraluka Visas Marr, to assassinate the Exile. However, after a brief lightsaber duel she was able to redeem Marr, accepting her into the ship’s crew and retraining her in the ways of a Jedi Sentinel. With Marr gained as an ally, the Exile knew she could not hide her presence for long, however she also knew that she had an inroad into finding at least one of the Sith Lords who hunted her. The Exile also helped Bao-Dur overcome his guilt over the lives lost at the Battle of Malachor V, and trained him in the ways of a Jedi Guardian. When two Twi’leks on Nar Shaddaa warned the Exile about Atton Rand—saying he was a killer and not just a soldier—the Exile asked him about this. Rand was initially upset about being asked about his past, but he revealed his past as a soldier under the Republic during the Mandalorian Wars, and as a Sith trooper during the Jedi Civil War. He told her that he decided to leave the Sith after he killed a female Jedi, with whom he fell in love with, after she showed him the Force. After the Exile forgave him for killing that Jedi and welcomed his honesty, Rand asked the Exile if she would train him to be a Jedi. The Exile agreed, training him as a Jedi Sentinel. At this point Brianna was still wary of the Exile, but through acts of kindness and charity during their journey, Brianna finally believed that Atris had been wrong in her judgments. Not soon afterwards the Exile asked Brianna to teach her Echani fighting techniques, and over the course of their journey they sparred three times, each time learning more about each other and became closer. During that time the Exile challenged her traditions about sparring without clothes, and she conceded that bulkier clothes would be more practical. She surprised the Exile by then changing into a Jedi robe. When asked, she finally revealed that they were the last keepsake of her mother, the exiled Jedi Master Arren Kae. She opened up to the Exile and revealed the story of her past, but she asked that it be kept secret from the rest of the crew, as she had come to trust the Exile over everyone else. After their third sparring session, the Handmaiden stated that she had nothing left to teach the Exile. The Exile then, despite the warnings from Kreia, offered to train Brianna as a Jedi Guardian, an offer she gladly accepted. In that moment, Brianna renounced her oath to Atris, and pledged herself to the Exile’s training and service for as long as they would be together. The Exile endeavored to stabilize the political conditions on several planets: on Nar Shaddaa she helped the refugees who were being exploited by the Exchange criminal organization, destabilizing its operations on the moon by killing the Quarren crime lords Saquesh and Visquis. She also destroyed the crime lord G0-T0’s flagship, the Visionary. G0-T0 himself went along with the Exile in hopes of stabilizing the galaxy. He later admitted to her that he was the droid intended for the Telos Citadel Station. She then met with Jedi Master Zez-Kai Ell and convinced him to go to the ruins of the Dantooine Jedi Enclave. After the Exile’s exploits on Nar Shaddaa, she discovered that the bounty hunter Mira, who joined her party on Nar Shaddaa, was Force-sensitive, and she showed Mira how to harness the Force. When the Exile and her crew traveled to Onderon, the Ebon Hawk was attacked by one of General Vaklu’s commanders, Colonel Tobin. After destroying the Onderonian starfighters sent to intercept the Ebon Hawk, they were forced to land on Dxun, the moon of Onderon where she fought during the Mandalorian Wars. After completing various tasks, the Mandalorian leader on Dxun, Mandalore the Preserver, allowed the Exile to take one of their shuttles to Iziz, the capital of Onderon. After gaining contact with Jedi Master Kavar in the Iziz Cantina, Tobin interrupted the meeting, forcing Kavar to flee, but not without promising to contact her when he was able. The Exile and Mandalore killed Tobin’s forces that attacked them in the cantina and the western square, and proceeded to leave the city. After they returned to Dxun, Mandalore joined the Exile not only because he felt she need an ally against the Sith, but because he intended to look for Mandalorian clans on other worlds so that he could reunite them under his leadership. The Exile then helped Mandalore in finding scattered clans on Nar Shaddaa and Dantooine. When she traveled to Dantooine, she met with Terena Adare, who was the Khoonda outpost’s administrator. Adare granted the Exile permission to search for Vrook Lamar in the Jedi Enclave’s ruins. The Exile met a scientist and historian named Mical, who was the Exile’s prospective Padawan before she left to fight in the Mandalorian Wars; he joined her crew and was eventually re-trained as a Jedi Consular by the Exile. After rescuing Lamar from being shipped to Nar Shaddaa by a band of mercenaries in the Crystal Cave, she was confronted by the mercenary leader Azkul, a veteran of the Jedi Civil War who was trained at Darth Malak’s academy. Azkul asked the Exile to join him and take over Khoonda; however, she refused, and he left, ordering the mercenaries accompanying him to kill the Exile. After defeating them, she returned to Khoonda, bolstered its defenses and finalized the battle plans with the local militia leader, Zherron. She and Lamar fought in the ensuing battle, killing Azkul and his mercenaries. Having successfully defending Khoonda, she spoke with Lamar, and convinced him to meet with the other Jedi Masters she would find at the Academy. The Exile eventually received a message from the Mandalorian Kelborn, telling her that he had received a message from Kavar. She traveled to Dxun, where Kelborn told her that Vaklu met with the Council of Lords, and had them declare Queen Talia, who was his cousin, guilty of treason. Kreia sensed something stirring on Dxun, and asked Kelborn whether or not they picked up anything on their sensors. Kelborn confirmed that they had, and the Exile sent three members of her crew to deal with the Sith forces at the tomb of the ancient Sith Lord Freedon Nadd. She then traveled with Kreia and one other crew member in a Basilisk war droid provided by Mandalore. After the Exile and her companions landed in Iziz, they made their way to the Royal Palace, assisting Captain Bostuco in defeating Vaklu’s exterior forces. When she made her way into the palace, Tobin locked the door that led to the Queen’s throne room; after overriding the security codes, the Exile killed the drexl larva that Tobin and the Sith forces used to breach the throne room. She then assisted Talia’s forces in fighting Vaklu’s soldiers, killing all but four. After Vaklu ordered the four remaining troops to kill Talia, Kavar and the Exile intervened, killing them and defeating Vaklu. Kreia then tried to convince the Exile to have Talia execute Vaklu, who was unarmed at the time, claiming he was too dangerous to be left alive. The Exile, while respecting her council, said that the decision was the queen’s to make, not hers. Talia then ordered her troops to execute Vaklu, ending the Onderon Civil War. After the battle, the Exile spoke with Kavar, who said he would meet with her and the Council on Dantooine. The Exile went in search of the Jedi Master Lonna Vash on the ancient Sith homeworld of Korriban. After Kreia telepathically guided her through the Valley of the Dark Lords, she entered the abandoned Sith Academy and found that Darth Sion had killed Vash no more then an hour after they landed. Before the Exile and her companions escaped the Academy, they were confronted by Sion, who told the Exile that he studied and “immersed” himself in her, and that he knew of the paths she walked in exile. He said that he knew her teacher, Kreia, and of the fires that raged on Dxun while the Republic died around her. Sion further stated that she knew of war and battle, and said that he knew of Malachor. Sion said that she knew what it meant to be broken, and warned the Exile that Kreia would destroy her as she had done with him, and said that he could end her suffering at Kreia’s hands before it began. With these words, the Exile and her companions fought the Lord of Pain, striking him down multiple times, yet the Dark Lord would recover from the fatal injuries and keep fighting. Through the Force, Kreia told the Exile that Sion was not a beast of flesh and blood, and that it was not a battle that could be won. She told her that while there would be another time, now was not the right time, not while Korriban ran through Sion. The Exile thanked Kreia for the information, and she and her companions fled the Sith Academy. While exploring the shyrack caves near the Sith Academy, she found the hidden tomb of the Sith Lord Ludo Kressh. When she went inside, the Exile was forced to confront many of her own personality traits as well as many of her past choices and regrets. This took the form of a series of visions, during which she witnessed a twisted version of when she was recruited by Malak, a recollection of her actions during the second battle of Dxun, an illusionary confrontation between Kreia and various members of her party, and finally a silent apparation of Darth Revan, with whom she did battle. During these sequences much of her character was revealed, determined by her choices. After locating and conversing with all of the remaining Jedi Masters, the Exile returned to Dantooine to find the rebuilt Jedi Enclave. There, Masters Lamar, Kavar, and Ell had formed a Council in which they would decide her fate. The Masters concluded that, through her actions at Malachor V, she had become a wound in the Force. They stated that she carried the deaths of all who died in the battle within her, and that she regained her connection to the Force by feeding on death and leeching the life energy of her companions. According to the Masters, the Sith had learned their ability to feed on the Force from her, and thus she was a threat to all living beings, and possibly the Force itself, and in time she might possess the same magnitude of power like Darth Nihilus and ultimately consume the galaxy. They deemed it necessary that she be stripped of the Force with or without her consent; she submitted to their sentence. Having re-established her previous sentence of exile, they attempted to strip her of the Force, but before they could finish, Kreia stormed into the meeting to save the Exile at the last moment. The Exile, still under her stasis established by the reconvened Jedi Council, was left helpless and could not defend them as Kreia, who revealed her true identity as the Sith Lord Darth Traya, used the Force to drain the Jedi Masters of the powers, putting them through the same suffering the Exile had felt on Malachor V. This left them not only dead, but void of the Force. After Traya left, the Exile finally regained her strength and departed for Telos IV to find and confront her. There the Exile found Brianna defeated at the hands of a corrupted Atris. In order to save Brianna, the Exile was thus forced to confront Atris, who had fallen to the dark side. After she defeated her, the Exile persuaded Atris to forgive her and helped Atris see the folly of her beliefs. Atris then told the Exile that Traya had fled to Malachor V to wait for her there for a final confrontation, and confirmed her identity as one of the Lords of the Sith, one of those that had murdered the Jedi. After the duel, Brianna pledged her allegiance to the Exile, renouncing her title of Last of the Handmaidens, and embracing her true name. The Exile then left Atris in the Academy until her role in nearly destroying the Jedi could be judged by the Exile’s apprentice Mical and the new Jedi Council. Shortly thereafter, the Exile participated in the Battle of Telos IV. and faced Darth Nihilus aboard his flagship Ravager to keep him from destroying Telos, which he was doing to fuel his hunger for the Force. With the assistance of Nihilus’ former Sith apprentice, Visas Marr, and Mandalore the Preserver, the Exile vanquished the Sith Lord. After crashing on the surface of Malachor V, the Exile proceeded to the Trayus Academy, where she demonstrated her strength with the Force and her skill in lightsaber combat against hordes of Sith Assassins, Lords, and Marauders before confronting Darth Sion himself. After persuading Sion to let go of his hatred, which caused him to finally succumb to his numerous injuries and die, she confronted and tried to redeem Traya. But Traya would not have it; though she was warmed by the thought that her former pupil would still care enough to try and “save” her from the dark side. She vowed that this confrontation could only end in death, and that if the Exile would not fight her, she would break her as she did Sion. After a fierce but short battle, the Exile severed Traya’s remaining hand, as well as their Force bond in a single stroke. Traya hissed at the Exile to finish her, but even after all the evil things Traya had done to her, the Jedi Order, and the galaxy, she chose the path of the Jedi and spared the wounded Sith Lord. Rather than accept mercy, Traya became enraged and continued to battle by animating three lightsabers to do battle for her with the Force, until the Exile had no choice but to strike her down and finish her once and for all. Before she died, Traya told the Exile that she was greater than any she had ever trained. In her final moments, Traya gave the Exile information about Revan’s location in the Unknown Regions and about the future fates of the Exile’s allies, the planets they had visited, and the future of the Republic. Shortly after Traya’s death, Bao-Dur’s remote reactivated the Mass Shadow Generator in order to completely destroy the planet. The crew of the badly damaged Ebon Hawk retrieved the Exile and escaped the planet. The Exile returned to Dantooine to complete her training as a Jedi, then she ventured into the Unknown Regions in search of the Jedi Knight Revan, and was never seen again. She left her apprentices behind to resurrect the fallen Jedi Order. Throughout her life, the Exile formed bonds with her comrades, even those who were supposedly her superiors or lesser in rank. It was said that during her training, many fellow Padawans were quick to do whatever she did, and that others disliked her intensely. She was regarded as a natural leader and a quick learner as well as generous and kind, though beyond this the personality of her early life is largely unknown. In the wake of the Mandalorian Wars, the Exile returned to the Jedi Temple on Coruscant to answer for her actions. She was fully aware of what she had done, and tried one last time to convince the Jedi Council of the rightness of her—and by extension Revan and Malak’s—actions. Despite her conviction and understanding of the consequences, she was exiled; in defiance, she stabbed her lightsaber into the center stone of the Council chambers when asked to surrender it. After her departure, her former Master Kavar mentioned that there was much defiance in her. Following the exile’s path, she forsook the company of others, preferring to wander about the Outer Rim in solitude. The wars had left many scars on her, both physical and mental, and she was left with a feeling of regret for what she had done and what she had been asked to do. During her exile, when she heard of the war started by Revan, she wondered if she could have been so blind or if the galaxy was so truly incomprehensible. She then retreated further into herself, forsaking all Jedi principles excluding one: no attachments. She disliked having to speak about the war, even after returning to the Republic and traveling amongst friends. She was even uncomfortable discussing the war and its end with Bao-Dur, her old friend from the war. Her wanderings served to maintain the discipline she had built up during her years of training and suffering the hardships of war. Starting with her meeting of Kreia in the Peragus facility, the Exile began once more to form bonds with people she met during her travels, people with whom she had an interest in helping to keep alive so that they, in turn, could protect her. Eventually she began to realize the leadership role she was destined for, embracing it in order to teach those Force-sensitives in her company to become the foundation of the new Jedi Order. Also during this the Exile saw it as her duty to help stabilize the Republic in any way possible, reflecting her old sense of compassion and generosity that had initially driven her to war. Because of her experiences in the Mandalorian Wars, she also understood the nature of war and battle and the hard choices that had to be made when conflict was inevitable. The Exile, at first, was a Force user of average ability, yet she was a natural leader. At a young age she demonstrated an unusual ability to influence others, and the Jedi Masters believed that she could form bonds through the Force to easily to those around her, an ability she was not consciously aware of. After reconnecting with the Force, this ability became stronger. Simply by observing another in action, the Exile could instantly learn Force techniques and lightsaber forms that would take a Jedi Master years to perfect. It was believed by Masters Zez-Kai Ell, Kavar, and Vrook Lamar that this was because of the wound in the Force that surrounded her, which allowed her—like Darth Nihilus — to feed on the death of other life forms to sustain her Force powers. This wound was caused by the Battle of Malachor V, and was what originally blocked her connection to the Force. It was also because of the nature of such wounds to feed on death that the Exile began to regain her Force connection on Peragus II, after all the personnel were killed by HK-50’s machinations. When the Exile traveled the galaxy, killing hundreds in her search for the Masters, she unconsciously fed on all that death, fueling her powers. It was this that caused the Masters such fear—both at her trial and after she had united them on Dantooine—as they thought her condition to be not only a threat to the Jedi and the Force, but a threat to life itself. Through her informal apprenticeship to Kreia, the Exile was able to learn a number of rare and advanced Jedi techniques, including Breath Control and Beast trick. Kreia also taught the Exile a powerful form of mind reading, where one could read the innermost thoughts of another. Kreia was very impressed with the speed in which she learned this power. She said that most Jedi Masters studied many years to learn the technique. The Exile was also proficient in other Force powers, including Force Valor, Force Resistance, Force whirlwind, and the Mind trick. She also learned many techniques from her companions: Atton Rand taught her to shield her thoughts, Brianna taught her Battle Precognition, Mical taught her an advanced form of meditation, and Visas Marr taught her how to see through the Force. She also learned Moving Meditation while trying to improve the functionality of her utility droid T3-M4. She learned the light-sided Force technique known as Force Enlightenment, after nearly being severed from the Force by the reconvened Jedi Council, and after Kreia, who had revealed herself as Darth Traya, betrayed the Exile by murdering the Masters. The Exile defeated a number of high-profile adversaries, including Azkul, Vaklu, Atris, and the Sith Lords Darth Sion, Darth Traya, and Darth Nihilus. She was skilled in the art of lightsaber combat, utilizing the lightsaber forms Shii-Cho, Makashi, and Soresu, and was known to have used at least one advanced Force technique, known as Force Channel. She was also proficient in many forms of hand-to-hand and melee combat. At the Telosian Jedi Academy, the Exile defeated five of the six Handmaiden sisters in hand-to-hand combat. On Dxun, the Exile defeated the two champions of the Mandalorians’ battle circle, Kelborn and Bralor, becoming the champion of the battle circle and earning the champions’ rights to criticize or praise any Mandalorian who sparred in the battle circle. Mandalore the Preserver told the Exile, in respect, that even with all their martial training, battles and ethics, even the greatest of his Mandalorian warriors were no match for her. She was also became one of the few Jedi capable of using Dun Möch, especially in a duel against Darth Sion who could not be defeated by normal means. The Exile eventually convinced Sion to let go of the Force and to finally allow himself to leave his life of pain and die. The Exile remains the only known light-sided Jedi that used the technique to it’s greatest extent (most Jedi that used the technique used an inverse variant of the technique, or in limited applications only). The Exile was also a very skilled tactician. She served during the Mandalorian Wars and had, by war’s end, risen to become Revan’s most trusted general besides Malak himself, and commanded about a third of the Republic fleet during the Mandalorian Wars. She is known to have taken part in both the second battle of Dxun and of Malachor V, both of which were victorious. She also proved her tactical brilliance, as well as her natural talents of leadership, after her return from exile, during the battle of Khoonda. On Dantooine a war had broken out between Khoonda and the forces of the mercenary Azkul. Both Khoonda and Azkul wanted the Exile on their side, but she decided to help Khoonda. Before the arrival of Azkul’s men to the battlefield, the Exile bolstered Khoonda’s defenses by persuading several civilians to join the Khoonda militia, healing those of the militia who were injured, planting more mines in the surrounding fields, and repairing damaged gun turrets and medical and combat droids. Within a matter of mere hours, she had turned a disorganized mess into a powerful army, able to defeat the larger forces of Azkul. The Exile was fluent in droidspeak, having worked alongside many utility droids during the Mandalorian Wars. She could also speak and comprehend Basic, Huttese, Mando’a, and Tchuukthese without the aid of a translator. She was also an accomplished swoop racer, winning sector championships on the Telos Citadel Station, Nar Shaddaa, and Onderon, and was also proficient at playing pazaak, a popular card game in which the goal was to reach 20 without going over. The ramifications of the Exile’s actions were still being felt throughout the galaxy nearly 4,000 years after the defeat of Darth Traya and the Sith Triumvirate. The Jedi she trained would go on to resurrect the all-but-decimated Jedi Order. Furthermore, the actions she took on Dantooine, Onderon, and Telos would ensure the solidification of a Republic that, because of the Great Sith War, the Mandalorian Wars and Jedi Civil War, had been teetering on the edge of collapse, prolonging its existence for several thousand more years.